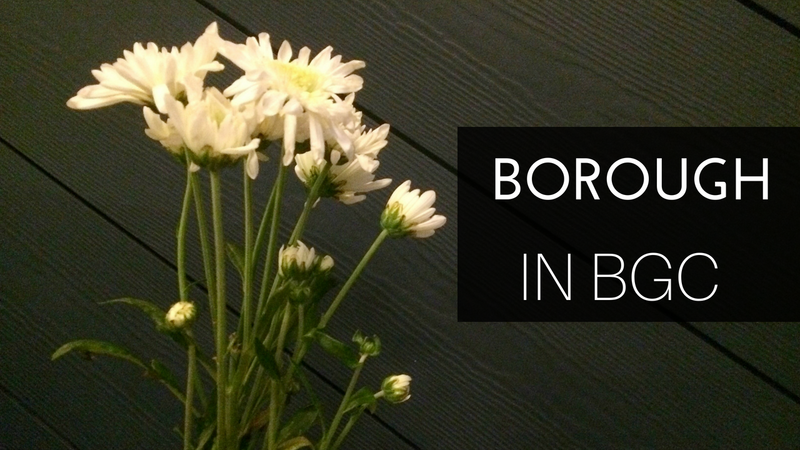 When we knew that Borough will have its soft opening in BGC, we know that we needed to be there! Pam always urged us to try their Grilled Cheese Sandwich as it's her forever favorite. And because we were disappointed by Early Bird Breakfast Grilled Cheese Sandwich, it's time to try the ones from Borough. Grilled Cheese Sandwich with Tomato Soup PHP320. Andy and I ordered the same thing just because we don't want to share. And it was the best decision! We went back with the girls Pam & AL. We ordered a different menu this time. Piled high and served with BBQ sauce and sour cream onion dip. Brioche Bun. Served with Borough French Fries. Undeniably, they have the best grilled cheese sandwich I had ever tasted! I am a sucker for cheese and this one is definitely two thumbs up for me. And the tomato soup? Nakakilig sya sa sarap! The second time we went there, I also loved all the food that we ordered. The Haystack Onions are my kind of onion rings. Not too big, thin and cooked crispy. You'll not even notice that those are onion rings. Best paired with dips. Andy ordered the Coconut Nutter cake. The cake was not too sweet, tamang tama lang sya and the coconut taste is visibly there. I had the All Beef Cheeseburger on medium rare and yung mga kasama ko naweirduhan sa kin. :D It was tasty and juicy! I actually loved it! The service is admirable. The staff are attentive and all out sa pagserve ng water. Friend na nga namin si Kuya waiter eh! They will be open 24 hrs after the soft opening. This is definitely good news for us! We found a place na for sure lage naming dadayuhin every payday!